Today’s Nintendo Direct revealed that Yoshi’s Crafted World will get a demo version of the first few levels today. This comes ahead of the game’s March release. Yoshi makes his Nintendo Switch debut with Yoshi’s Crafted World. This kooky, crafty game follows in the footsteps of Yoshi’s Woolly World, which featured Mario’s loveable dinosaur sidekick in a soft plush world. 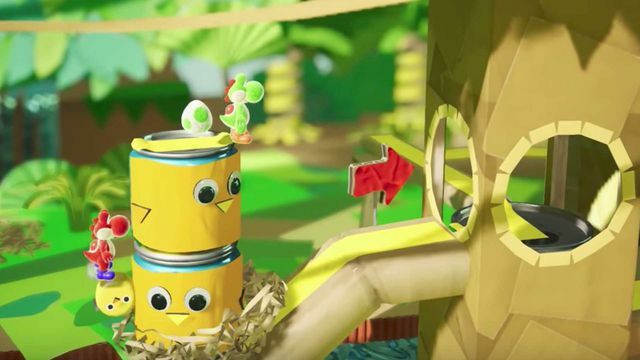 Yoshi’s Crafted World is another side-scrolling platformer, trading the woolly world for one made out of cardboard and other crafting materials. Unique to Yoshi’s Crafted World is the co-op mode, as well as the ability to walk backwards. Players will also be able to view the game from opposite viewpoints, as they navigate 3D characters in a 2.5D environment. The basic mechanics, otherwise, will be similar to other Yoshi games: Yoshi eats enemies and objects to turn them into eggs, and then throws them. Originally slated for 2018, Nintendo pushed Yoshi’s Crafted World into spring 2019 last summer. In January, the company confirmed the game would launch March 29.